The British Rail Mark 3 is a type of passenger carriage developed in response to growing competition from airlines and the car in the 1960s. A variant of the Mark 3 became the rolling stock for the High Speed Train (HST). Originally conceived as locomotive-hauled coaching stock, the first coaches built were for the prototype HST in 1972. Production coaches entered service between 1975 and 1988, and multiple-unit designs based on the Mark 3 bodyshell continued to be built until the early 1990s. The Mark 3 and its derivatives are widely recognised as a safe and reliable design, and most of the surviving fleet is still in revenue service on the British railway network in 2016. Under the chairmanship of Stanley Raymond, it was decided to reduce journey times further on long-distance trains by increasing line speed to 125 mph where practical - the maximum considered possible on Britain's Victorian-age railway. At the end of 1968 proposals were submitted to the Commercial and Operating Departments of British Rail for a new fleet of third-generation standard coaching stock, designed to run at 125 mph. The rapid development required for the HST in 1969 made the Mark 3 coach design the obvious choice for this train, and in 1972 the first Mark 3 coaches were built, ten for the prototype HST. The Mark 3 looks similar to Mark 2D, 2E and 2F coaches, but is of a completely different design. It has a ridged roof and under-frame skirt compared with a smooth roof and visible below-frame equipment on the Mark 2. The bodyshell is 75 feet (23 m) long, almost 10 feet (3.0 m) longer than the Mark 2, of full monocoque construction with an all-welded mild steel stressed skin, and has a reputation for its exceptional strength and crashworthiness. An important advance over its predecessor was the adoption of secondary air suspension between the body and the bogies, giving an exceptionally smooth ride. The bogies, classified BT10 (BT5 on the prototype vehicles), were designed specifically for the Mark 3 and have coil-spring primary suspension with hydraulic dampers, enabling a maximum speed of 125 mph (200 km/h) — the Mark 2 is limited to 100 mph (160 km/h). Disc brakes in place of the Mark 2 clasp brakes completed the engineering package enabling - in conjunction with wheel slip protection (WSP) - efficient deceleration from 125 mph and almost silent brake operation. Ancillaries such as electrical and air-conditioning systems were grouped together in discrete modules housed behind an aerodynamic skirting between the bogies; on the Mark 2 these were mounted above and below the passenger seating area. The lighting and air-conditioning fittings were for the first time integrated into the ceiling panels. Other new features were the pneumatically operated automatic gangway doors triggered by pressure pads under the floor. A speed-operated central door-locking system for the manually operated slam-doors was installed from 1993. The main difference between the HST vehicles and the loco-hauled Mark 3A relate to electrical supply arrangements. HST coaches take an industrial voltage/frequency 3-phase supply directly from an auxiliary alternator in the power car to supply on-board equipment such as air conditioning; loco-hauled vehicles take a standard single-phase 1000 V AC or DC train heat supply from the locomotive and convert it through motor generator units under the floor. These convert the train supply to 3-phase 415/240 V 50 Hz AC to power air conditioning and other ancillaries. The two types are non-interconnectable in service conditions. The other main difference is the lack of buffers on HST coaches. The later Mark 3B build provided first class loco-hauled vehicles for the West Coast Main Line. These are similar to Mark 3As, but have an improved motor alternator unit with compound-wound motor, and seating derived from the Advanced Passenger Train (APT). 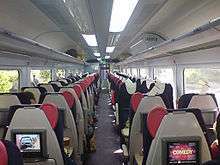 Ten coaches were constructed to run between a pair of Class 41 power cars as the prototype HST, exploring different seating and layout options for first and standard class passengers, and evaluating different designs of catering facilities. In 1973 the prototype HST was evaluated as an 8-coach formation. The two spare coaches, 2903 and 2904, were rebuilt and redeployed in the Royal Train, where they remain. Initial plans for a large fleet for almost all InterCity services were amended prior to construction to provide stock for the planned HST fleet, resulting in a much smaller fleet of loco-hauled coaches for the West Coast Main Line. A much reduced number of coaches were manufactured, requiring many Mark 2D, 2E and 2F coaches to remain in service. The table below lists manufacturing variants as built, showing the quantity of each type/designation and original running numbers. See British Railway Coach Designations for the meaning of RSB, TRUK, BFO etc. The bodyshell was also used as the basis for Northern Ireland Railways' 450 Class DMU. Since 1977, the Royal Train has included some specially equipped Mark 3 coaches. Mark 3s remain in service as part of HSTs with CrossCountry, East Midlands Trains, Great Western Railway and Virgin Trains East Coast much as they have since introduced. These were refurbished when their operators were privatised, with all except East Midlands Trains’ receiving new seats between 2006 and 2009. The introduction by Virgin CrossCountry of 220/221 Voyagers in the early 2000s rendered many Mark 3s surplus. After periods of storage, all have now returned to service with other operators. The introduction by Virgin Trains of Class 390 Pendolinos in the early 2000s resulted in the withdrawal of the locomotive hauled Mark 3s. Some were cascaded to One to replace Mark 2s on the Great Eastern Main Line, while a few replaced Mark 2s on the Night Riviera. Most were placed in store at Long Marston. Many have since been returned to service, both as locomotive hauled coaches with Arriva Trains Wales, Chiltern Railways and Wrexham & Shropshire as well as being converted for use with HSTs by Grand Central and CrossCountry. This required modifications to the coupling mechanisms and electrical systems to make them compatible with Class 43 power cars. Mark 3 sleeping cars are used on the overnight Caledonian Sleeper and Night Riviera services. Virgin Trains retained one complete Mark 3 set. Initially used to cover peak-time Euston to Birmingham services while the Pendolinos underwent modifications, but later covering the loss of 390033, written off after the Grayrigg derailment in 2007. 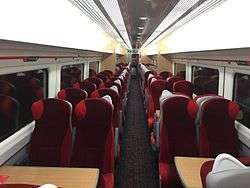 In July 2009, it was refurbished and repainted at Doncaster Works in the same style as the Pendolino and Voyager fleets, but with the British Rail seats and interior fittings retained. This set was nicknamed the "Pretendolino" by enthusiasts. It was transferred to Abellio Greater Anglia in November 2014. In 2016 it moved to TransPennine Express to be used as a crew trainer in the lead up to the introduction of Mark 5s. In the UK train operators are allowed to discharge 5 imperial gallons (23 l; 6.0 US gal) of sewage per carriage per journey onto the track. Most Mark 3 carriages have no retention tanks, discharging onto the track via a U-bend/pipe near the bogies, and in the 2000s both the RMT trade union and politicians were concerned at the environmental impact of this legacy issue. The problem was first raised in 2003 after Railtrack staff at Nottingham abandoned local clean-up and then track maintenance procedures due to an excessive build-up of sewage waste in the area. In 2006 the RMT agreed waste tank and clean-out developments at Northern Rail's Heaton depot in 2006 with GNER, and new clean-out procedures at all other depots, to solve an ongoing dispute over the previous 18 months. By 2011, the European Union had started a formal investigation to see whether trains composed of such carriages were breaking EU environmental and health laws, although the Environment Agency confirmed that train companies claimed special exemptions to dump waste on the track. In 2013, Transport Minister Susan Kramer branded the practice "utterly disgusting" and called on the industry to take action. ATOC responded by stating that, as all new vehicles had to be fitted with compliant toilet tanks, withdrawal of the HSTs by the end of 2017 would solve the problem. The original coaches were delivered in HST sets for Western Region (Class 253) with Trailer First (TF), Trailer Second (TS), and Trailer Buffet Second (TRSB) cars in the formation TF-TF-TRUK-TS-TRSB-TS-TS. Complaints from guards about engine noise in the guards' compartments in the power cars led to the Trailer Guard Second (TGS) in 1980, based on the TS but with the end vestibule and one seating bay replaced by a guard's compartment. This replaced the last TS in all sets from 1980 onwards. Sets delivered for Eastern Region (Class 254) contained eight coaches, originally in the formation TF-TF-TRUK-TS-TS-TRSB-TS-TS. The TRUK cars were quickly replaced by a TS on the Western Region and most had been replaced on the Eastern Region by 1985 (many later rebuilt into loco-hauled buffet cars). TRUB cars (Trailer Restaurant Unclassified Buffet) were built from 1978 to replace the TRUK cars, and these were reclassified as TRFB (Trailer Restaurant First Buffet) from 1985 on the Eastern and London Midland Regions and from 1989/90 on the Western Region. Virgin CrossCountry operated HST sets in shortened five-car formations between 2001 and 2004. This gave the trains better acceleration, similar to the Voyager units. East Midlands Trains and Great Western Railway operate HST sets in eight car sets, Grand Central five, CrossCountry seven, Virgin Trains East Coast nine. Mark 3A coaches were deployed on West Coast Main Line expresses out of Euston to bring the three main long-distance routes from London up to the same standard. Initial variants were Second Open (TSO) and First Open (FO). Catering and sleeper vehicles continued to be Mark 1 stock until the introduction of Restaurant Buffet (RUB) vehicles in 1979-80 and the sleeper (SLEP) vehicles in 1981-82. In 1988 the process was completed with the elimination of Mk 1 parcels vehicles and their replacement by Mk 3-derived Driving Van Trailers, making the WCML push-pull. Scottish Region push-pull services were initially made up of four TSO and one FO Mark 3A coaches with a Mark 2F DBSO. The FO was later converted to a CO by the declassification of half a coach and installation of a partition between the two classes and an SO was removed. These vehicles were removed from the Scottish regional routes in 1989 when they were replaced with Class 158 multiple units. The Driving Van Trailers have been modified with diesel generators to provide Electric Train Supply to the coaches when the locomotive is not running, such as when in terminus stations and when stabled. Current coaches (2015) typically have 74 seats (Standard class) in a 2+2 arrangement or 48 seats (First class) in a 2+1 arrangement. Abellio Greater Anglia use a mix of eight, nine and ten coaches in their trains. In 2009 First Great Western introduced 'entertainment carriages' with at-seat television screens known as Volo TV. The system, which FGW claimed was a "world first", was fitted to standard-class carriage D. The service, originally charged for, eventually became free, although users either had to provide their own headphones (standard 3.5mm stereo mini-jack plug) or purchase a pair from the on-board Express Cafe for £1.50. In addition to radio and video feeds, a GPS train-location screen allowed passengers to check and track train progress. For this purpose an aerial had been fitted to the roof of these coaches. With the advent of portable media devices and tablet computers, the Volo TV service was used less and less until in 2015 it was discontinued and the screens removed. In 1979 British Rail ordered 236 Mark 3 sleeper carriages. Because of cost over runs partly caused by more stringent regulations in the wake of the Taunton sleeping car fire the order was cut back to 207. However even this was too many, as by the time they were delivered British Rail were withdrawing sleeper services. In 1987, ten were leased to Danish State Railways while in 1994, three were sold to Swiss bogie manufacturer Schweizerische Industrie Gesellschaft for tilt train testing. In 1995 Porterbrook experimentally converted one to a day carriage. GNER purchased 13 with the intention of converting to High Speed Train carriages, but the project was aborted. Five were converted to generator vans as for the aborted Nightstar service. One was purchased by UK Rail Leasing for use as a carriage heater at its Leicester depot in 2016. English Welsh & Scottish investigated converting Mark 3s for use on high speed freight trains. Many of the Mark 3s are scheduled to be withdrawn by 2020. Great Western Railway and Virgin Trains East Coast sets will be replaced by Class 800, 801 and 802 sets. The East Midlands Trains sets were also scheduled to be replaced when the Midland Main Line was electrified, but the July 2015 deferment of this project may result in the HST sets being retained. Approximately 120 Great Western Railway Mark 3s are to be transferred to Abellio ScotRail in 2018 for use on Glasgow/Edinburgh to Aberdeen/Inverness routes. The Caledonian Sleeper Mark 3 sets are scheduled to be replaced in 2018. Abellio Greater Anglia's are to be replaced by 2020. Grand Central are to withdraw their sets in 2018. Many former Mark 3 sleeping carriages were sold to railway preservation organisations for use as accommodation vehicles. Three former Virgin Trains Mark 3s, RFM 10206, FO 11074 and TSO 12092 are now owned by the 125 Group and based at the Great Central Railway (Nottingham). They have been repainted to operate with and match preserved prototype HST power car 41001. The Mark 3 formed the basis of BR's Second Generation multiple unit fleet, introduced from the early 1980s. Electric multiple units include the 25 kV AC Classes 317 and 318, the 750 V DC Classes 455 and 442, and the dual-voltage Class 319. Diesel multiple units include the short-lived diesel electric Class 210 and the diesel-mechanical "Sprinters" of Class 150. The cars for Classes 150, 210, 317, 318, 319, 320, 321, 322, and 455 units are built on 20 m frames, and are outwardly similar. Those for Class 442 are on 23 m frames, and look very similar to the Mark 3 coach. The main visual difference is the swing plug automatic doors rather than the traditional "slam-door". The Class 153 and Class 155, while of the "Sprinter family", are built by British Leyland and have no connection with the Mark 3, neither does the Class 156, built by Metro-Cammell. The final batch of "Sprinters" of Class 158 (some rebuilt as Class 159) are of a design intermediate between that of the Mark 3 and the Mark 4. Nine 450 Class DMUs were built at Derby for Northern Ireland Railways using Mark 3 bodyshells and Mark 1 underframes, together with refurbished power units and traction motors, recovered from the former Class 70 units. The last Mark-3-based EMUs built are the Class 321, 322 and 456 units. Iarnród Éireann BREL Mark 3 carriage at the North Wall, Dublin, September 2014. 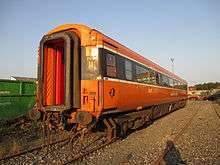 The Republic of Ireland's national rail operator, Iarnród Éireann, ordered Mark 3 carriages built between 1980 and 1989, with bogies for the Irish gauge of 1600 mm (5 ft 3 in). The fleet consisted of 124 Mark 3 and nine Mark 3A Internationals, which worked only the Dublin–Galway service, branded Cú na Mara or Hound of the Seas as it was a coast-to-coast route. 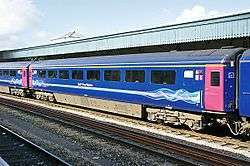 Throughout the 1990s and 2000s they were the backbone of the Irish InterCity rolling stock. They were built with automatic plug doors, which initially caused some concern as additional time and resources were required to perfect them. The design was later used on the Class 442 "Wessex Electrics". Most of the fleet was air-conditioned, except for a small number of coaches built as outer-suburban stock, which ran in push-pull configuration. A number of coaches were first class, and there were several dining cars and five driving van trailers (DVTs) that included passenger seating. There were also a number of accompanying generator vans to supply power. In 2006-07, Irish Mark 4 carriages were introduced on the Dublin-Cork route, with the displaced Mark 3 coaches to other InterCity routes. In 2008, Iarnród Éireann began taking delivery of 22000 Class railcars, which led to withdrawal of all Mark 3 coaches. The type's final service was a Dublin-Cork relief train on 21 September 2009. Efforts were made to sell the 130 carriages but some were still stored in various locations. During 2015 some carriages were refurbished for use on the Grand Hibernian luxury train, which began operating on 30 August 2016. Between 2013 and 2014, most of the Iarnród Éireann Mark 3s were scrapped at Waterford, Dundalk, and Adelaide Depot in Belfast. In 1987, ten sleepers were leased to Danish State Railways. They returned in November 1998 and placed in store at MoD Kineton. In 1994, three sleepers were sold to Swiss bogie manufacturer Schweizerische Industrie Gesellschaft for tilt train testing. ↑ Haresnape, Brian (1983). British Rail Fleet Survey, 5: High Speed Trains. Ian Allan. pp. 4–7. ISBN 0-71101297-0. ↑ "Grand Central Railway to operate HST power cars and loco-hauled Mk3s". The Railway Centre. 5 October 2006. ↑ Tom Geoghegan (24 July 2003). "Toilet waste 'hampers rail repairs'". BBC News. Retrieved 13 November 2013. ↑ "Toilet waste 'sprays' track staff". BBC News. 6 August 2006. Retrieved 13 November 2013. ↑ "End 'disgusting' train toilet sewage - Lady Kramer". BBC News. 13 November 2013. Retrieved 13 November 2013. ↑ "Chiltern Railways puts refurbished Mk III coaches into service". Railway Gazette. ↑ "Mk3 Locomotive Hauled Coaches" (PDF). Porterbrook. Derby. July 2012. p. 6. Archived from the original (PDF) on 22 February 2015. Retrieved 22 February 2015. ↑ Shem, Pennant (7 June 2010). "Latest Gadgets round up: Heart rate monitors, Volo TV and Jinx tees". LatestGadgets. Archived from the original on 2010-06-13. Retrieved 13 June 2010. ↑ The Volo: TV information screen. Cooper, B K (1981). British Rail Handbook. Shepperton: Ian Allan. ISBN 0-7110-1027-7. Fox, Peter (1984). Coaching Stock Pocket Book sixth edition. Sheffield: Platform 5. ISBN 0-906579-35-X. Haresnape, Brian (1979). British Rail 1948-78: A Journey Through Design. Mallaband, P; Bowles, LJ (1976). The Coaching Stock of British Railways 1976. Oxford: RCTS. ISBN 0-901115-39-4; ISBN 0-901115-39-8 (corrected). Mallaband, P; Bowles, LJ (1980). British Rail Coaching Stock 1980. Oxford: RCTS. ISBN 0-901115-50-9.